TOP: This wind turbine erected just south of St. Michael Indian School went into operation Oct. 4, 2011. It produces 2,400 kilowatts of energy for the campus. Monitoring the turbine are, left to right, grants program director Manuel Espinoza, Kieran Gorman, Jennifer Yazzie, Brannon Curtis and Samantha Hardy. BOTTOM:St. Michael Indian School students and grant program director Manuel Espinoza, left, pose in front of photovoltaic solar-energy system. From left are Kieran Gorman, Samantha Hardy, Jennifer Yazzie and Brannon Curtis. If a driver glances toward St. Michael Indian School from Lupton road (Navajo Route 12), a spindle-thin pole is visible just above the trees. Turn on to the paved road leading to the school's parking lot and the pole becomes a slender, oddly elegant windmill. In technical terms, on a windy day this 2.4-kilowatt wind turbine atop a 55-foot monopole tower can produce 2,400 watts of energy. In practical terms, the structure provides power for the high school's two computer labs. The wind turbine is only one of many green projects at St. Michael. 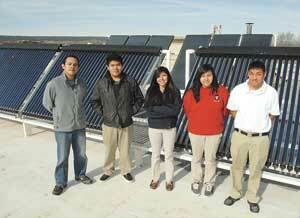 On Dec. 12, 2011, St. Michael High students heard the school's grants program director, Manuel Espinoza, explain several efforts at the school to create energy self-sufficiency. The guiding principles of self-reliability and resourcefulness that maintained the 109-year old mission school are as true today as ever. Espinoza described the early St. Michael school as one that produced its own heat, electricity and water and grew its own food. Students were trained in agriculture and animal husbandry, carpentry, masonry and blacksmithing. However, over time self-produced steam heat was replaced with modern gas heating. Espinoza went on to explain the more recent history of a "renewable campus" mind-set and aspirations of energy self-sufficiency by 2020. In 2007, the school initiated an energy audit in partnership with the Community Energy Program under the Arizona Department of Commerce (currently run by the program manager for energy efficiency under the governor's Office of Energy Policy). As a result, the school took steps to become more energy efficient. This included installing insulation in attics, replacing manual thermostats with programmable versions, and replacing drafty windows. By 2010 the savings from these projects paid for themselves. Next the gymnasium was insulated and outdated lights and furnaces were replaced with 95-percent efficient units. Finally, an additional 110 windows were replaced with double-pane energy efficient units. Espinoza said the school received a materials-only grant from the Renewable Energy Investment Fund to install three renewable energy systems on campus. With additional funding by over a dozen individuals and organizations, the first of the three projects - a solar thermal water system - was in operation by May 2011, providing solar-heated water to the campus and school residences. During the summer months the school enjoyed several weeks of 100-percent solar-heated water. A wind turbine went into operation on Oct. 4 and on Oct. 17 a photovoltaic solar-energy system was installed on the roof of the school's workshop. Espinoza said the turbine and photovoltaic array have produced enough energy to power the latest game system, a big-screen television, and surround-sound system for over 551 days straight. At the Dec. 12 high school assembly, Espinoza and St. Michael President Sr. Kathleen Kajer stressed the educational benefits of the school's green efforts. In collaboration with Northern Arizona University's College of Engineering, Forestry, and Natural Sciences, St. Michael science classes are becoming involved in hands-on projects and curriculum that incorporate wind technology. 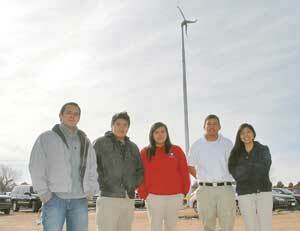 Students are seeing career fields in the wind industry, such as engineering and data analysis. The 2011-12 school year also marks the creation of an eco-club focused on a greener world. Espinoza said the school reduced utility bills by approximately 42 percent and could slash utility bills further with the three new systems and with future projects to come, including a soft-water system. Students and faculty are thinking green, understanding that creativity is a big part of economizing. One example is that many of the old windows that were replaced will used to build greenhouses and plant hotbeds in the near future. Leavitt is a teacher at St. Michael Indian School.